When asked what’s for dinner, some may say quesadillas, others will say tortillas but, often enough, they’ll both involve Farrah’s wraps. These versatile wraps can be enjoyed with almost any mix of fillings our hearts (and stomachs) might desire. However, thanks to a fresh range of recipes (such as this marvellous twist on a Mexican classic), there are now even more ways to enjoy Farrah’s famous flavours. Cut the chicken into strips, place in a bag or bowl and coat in spice mix. Heat a little oil in a pan on a medium heat until hot. Cook the chicken. 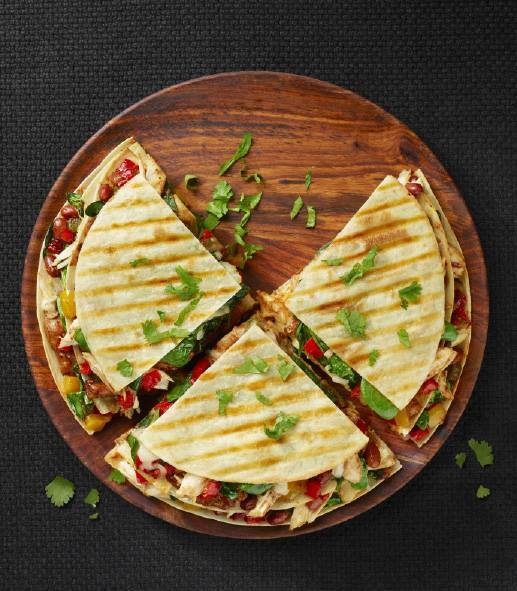 Place a tortilla on a board and layer with chilli beans, chicken, diced capsicum, cheese and a few spinach leaves. Place another tortilla on top and layer ingredients again. Place third tortilla on top. Toast the tortillas in either a sandwich press or frying pan. Alternatively, bake until golden and crispy and the cheese is melted.